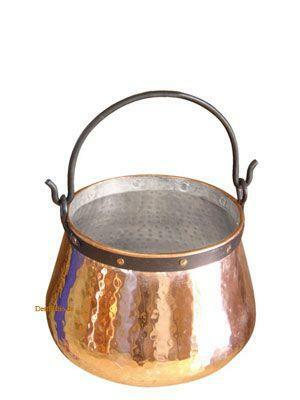 Why should a copper cauldron be tin-plated? If copper comes in contact with acid (e.g. vinegar or lemon juice), copper acetate can form on the caldron, and this is considered to be slightly harmful to your health. Therefore copper pots are not normally used together with acidic foodstuff - or one uses a coated copper utensil. Because of the electrostatic difference between stainless steel and copper, large cauldrons and pots are sooner coated with tin, which is harmlesss to your health. The thin tin coating takes on all the positive features of copper during cooking. A layer of stainless steel would be negative to the high heat conductivity. According to the public health authorities, a copper utensil must be tin-plated for commercial use. The only exceptions are regional permits, if it is determined in advance what will be cooked in the pot (e.g. potatoes).